Tablets are still preferred by the people who love to watch movies and play games. They have perfect screen size to enjoy movies and carry them around. Choosing a lost cost tablet with a nice brand name can be difficult. 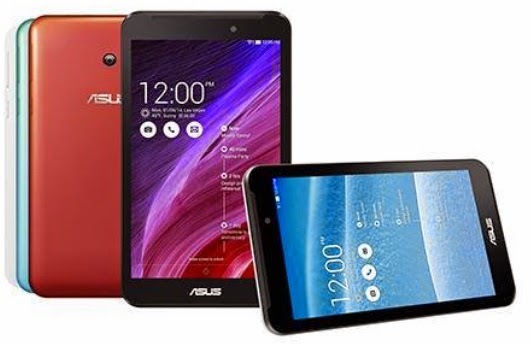 The Asus Fonepad 7 FE170CG which was launched in 2014 as a upgrade to the previous model, is a perfect fit for low cost tablets. Lets see what it has to offer and find out if its worth your money. The new Asus Fonepad 7 has a texture on the back with plastic case which looks very firm in the hands. The build is quite good and it will do good with rough and tough use. The front looks better with a slightly thin bezel and sturdy finish. The tablet doesn’t looks cheap in terms of build and design. Though the power button and volume rockers are a bit difficult to reach as they are not exactly on the side. The Fonepad 7 has a 7 inch display with a resolution of 600 x 1024 (~170 dpi). The screen is average and not too much attractive due to the resolution. The touch is smooth and it supports 10 point touch. Fonepad 7 is a dual sim tablet which supports 3G, so you can enjoy high speed internet connection. It runs on Intel Atom Z2520 dual-core processor clocked at 1.2Ghz. Though its a dual core processor, Intel’s hyper threading makes it perform like a quad-core. It has 1 GB of RAM which is enough if you don’t go for high end games. Multitasking works great with Fonepad 7 and there is no lag experienced while usage. From my review, I can assure you that performance is quite good and you will have no complaints while playing games, watching videos, or multitasking. You get different storage capacity according to the money you spend, we have 4 GB and 8 GB internal with an expansion capacity upto 64 GB. On the software side, we have Android 4.3 Jelly bean pre-installed, which can be upgraded to 4.4 Kitkat. There is no news of lollipop update. We have the Asus ZenUI running on this tablet, which have some very nice mods installed. I prefer ZenUI over the stock UI of android. On the back we have a 2MP camera which can click a photo of 1600 x 1200 pixel resolution. Now this is one of the negative points of this tablet, as its a below average camera. The front camera is of 0.3 MP again not of much use. Though you can turn on HDR and click photos in daylight to get some good results. Asus has some nice camera modes to enhance your photography performance. It can record 720p videos, again with a average quality. Audio quality is quite good on this device. We have the speakers in front-top of the screen. They are not too loud, but gives clear sound. Along with 3G we have Wifi, bluetooth connectivity. and GPS. Fonepad 7 also has a support for USB OTG, so you can directly attach pen drive to read write files. We have a non-removable li-po battery of 15 Wh (Watt-hr) which gives a very nice battery backup. The charging of the battery takes time, but once fully charge the battery can last a day with heavy usage too. So one important factor i.e. the battery backup is one of the strong points of Fonepad 7. The Fonepad 7 8GB model is available in Rs.7999 on Flipkart. There are many offers going on Flipkart, so you can probably get a nice discount on this amazing tablet. At this price range, this tablet is just perfect and I recommend it to you. Apart from camera, all other features are good. You will face no problem in multitasking and playing normal games. Games like Asphalt 8 and dead trigger were running smoothly at low graphics. If you have any doubts regarding this product, do mention it in the comment section below. Need help in buying new electronic gadget, contact me anytime.